"Politics is war without bloodshed. War is politics with bloodshed." Mao Zedong (December 26, 1893  September 9, 1976) was the first head of state of the People's Republic of China, having become head of the Chinese Communist Party in 1935 and lead it through the Chinese Civil War of 1946-50. He ruled the PRC until his death in 1976. Mao was born in Hunan Province in December 26, 1893 to a family of moderately well-off peasants (to give you an idea, had they been Russian rather than Chinese, they would probably have been considered kulaks). The young Mao was quite a rebellious lad, and had Abusive Parents. He managed to scrape enough money together from working on the family farm to get himself into high school. When the 1911 revolution got going he joined the local (Hunanese) revolutionary forces for a time, returning to high school once it was over so he could graduate. He later got job as a librarian at the Beijing University library, studying there on the side. It was in Beijing that he came in contact with Chinese Marxists. Mao later married Yang Kaihui in 1920, who was the daughter of his favorite professor, after his first unhappy arranged marriage that ended with the spouse dying. It didn't end well for Yang either, who was killed by Chiang's regime (the Kuomintang) in 1930. In 1921 Mao went to attend the foundation of the first (unified) Communist Party of China (CCP) in Shanghai. He soon became a low-tier leader, his contact with socialist thinkers shaping his thoughts on communist ideology. When the Guomindang/Kuomintang (GMD/KMT) under Chiang Kai-shek purged the socialists from its ranks during the course of its campaign to unify the country, he began to work against it and helped lead attacks on and uprisings against the GMD such as those in Changsha in the late 1920s and the early 1930s, but they proved to be ill-advised and were quickly crushed with much brutality. He fled to Jiangxi province with some survivors and may have been a founding member of the Chinese Soviet Republic there. After exterminating several other such Soviet Communes the GMD was poised to crush the Soviet in 1934, whereupon Mao and his troops staged a breakout and fled the province, cutting a swathe of destruction across the countryside as they took what they needed to survive at gunpoint. A tenth of this force, and leaders like Mao, eventually made it to an isolated Soviet in the mountains of Yan'an after completing what has become known as 'The Long March'. Mao managed to use his loyal troops to install himself as the leader of the Yan'an Soviet, and used this position to claim leadership of the entire CCP at the Zunyi Conference of 1935. Chiang was poised to destroy the Soviet, with a good chance of success, when the Warlord General Zhang Xueliang (son of the late Zhang Zuolin, 'The Tiger of the North') kidnapped him and forced to him to agree to an alliance with the communists against Japan, who invaded Manchuria in 1931. Chiang gave his word and called off the offensive, establishing 'the United Front'. In practice this treaty was more or less ignored by both sides, with GMD and Communist guerillas rarely co-operating and both parties' forces involved in an active stand-off along their shared border. The 'Hundred Regiments Offensive' of 1940 was launched as per Stalin's request to take pressure off the Guomindang (shortly after Soviet aid to the Guomindang had been retracted due to the requirements of the USSR's military modernisation program), and marked the only time the CCP can be confirmed (by non-CCP sources) to have fought Imperial Japan. It yielded some early successes because the IJA had expected the CCP to keep its truce with them, but they soon rushed in reinforcements and beat them back without too much trouble. After the offensive was over, the two made peace again and avoided fighting each other for the rest of the war - the IJA even allowing the CCP to set up numerous Soviets in the nominally-occupied (and in practice rather chaotic/anarchic) North China Plain on the grounds that it was better that the territories be controlled by the CCP than by the Guomindang or other partisan groups who might fight the Japanese occupation forces. When Japan surrendered in 1945, Mao and Chiang swiftly moved to set themselves up for the resumption of the civil war, even as the USA tried in vain to force the two to negotiate on forming a national government together. The USSR also hedged its bets and gave support to both sides, but timed their withdrawal from formerly-Japanese Manchuria to allow the Communists to take up good positions there. Mao stalled for time and Chiang played along until he felt his forces were ready, whereupon he launched a massive offensive against the Yan'an Soviet and wiped the Communist Party off the map within just a few months. Mao and his troops, however, had merely retreated into the countryside. The GMD soon proved to have spread the troops of their various factions far too thinly across the countryside, their attempt to secure Manchuria despite its massive size and the Communists' greater influence over the countryside soon proving fatal to the forces - Chiang's best - that were ordered to hold their positions there. Mao knew very well that the peasantry was deeply distrustful of what the Communist Party stood for - they associated Communism with the Soviets - but unlike the GMD he was very careful to avoid antagonising them and he won the very poorest peasants over with programmes of rent-reduction and moderate land re-distribution from the wealthy and unpopular. By mid-1947 the country suffered hyperinflation as the short-sightedness of the GMD's economic policies - they tried to balance their huge budget deficits by printing money instead of, say, making a serious attempt at re-centralising their administration and thereby correcting gross corruption at the local levelnote Because Jiang/Chiang wanted to concentrate on the military campaigns. This would've worked if the campaigns were as decisive as he was hoping - which they weren't. In hindsight he should've hedged his bets more and tried his darnedest to get the reform programme pushed through and implemented rather than just giving it a half-hearted go - began to tell, which made the Communists' reasonable credentials as a governing body look that much more attractive. With Manchuria secured for and its economy stabilised by the Communists, the Peoples' Liberation Army began to fight open battles with the GMD. They made great use of their superior manoeuvrability and intelligence - the product of a huge network of peasant-sympathisers who had been antagonised by the GMD - to crush or - more often - force the surrender of entire GMD formations one unit at a time. After a further two years of fighting, The Peoples' Republic of China was declared on October 1, 1949, whereas Chiang and his remnant forces retreated to the island of Taiwan. In 1949, China's economy was still in a deep depression with industrial production still at less than a quarter of 1937 (pre Second Sino-Japanese War) levels, and the banking and financial sectors more or less completely wiped out by the Guomindang's post-war economic mismanagement and the hyperinflationary spiral that followed. The treasury also had almost zero precious metals in it, the GMD having tried its darnedest to ship every single bar of their gold and silver reserves to their new capital at Taipei - and the Soviets take what's left, as the first of many payments they demand in return for their economic and technical assistance in rebuilding the Chinese economy. This is extremely galling to say the least, as the loss of a full 'half' of China's pre-war industry is their fault; when the Soviets liberated Manchuria from Emperor Puyi's (Japanese-controlled) puppet regime, they stripped the region of absolutely everything of worth, right down to office furniture... leaving tens if not hundreds of thousands of inner-city Manchurians to starve and freeze (to death) during the winter of 1946, as the Soviets had stolen the factories they used to work in and the power plants that used to provide them with electricity. Nevertheless, Mao's Party proceeded to revolutionize Chinese society - starting with former Guomindang soldiers and regime personnel, who were put into re-education (through hard labour) camps for the next few months-to-years. They were joined by the Communists' political opponents - such as the democratic liberals and moderate socialists - and members of the 'bourgeoisie' and 'landlord' classes. Most adult landlords were publicly executed after the show-trials that exposed their 'Crimes Against The Peasantry', but not all adolescent- and child-landlords were killed and in fact many were simply subjected to re-education (through hard labour). That said, virtually all of the more 'dangerous' and/or 'unreformable' enemies of the regime (like adult landlords) were executed; if you were sent to a camp, it was because the regime thought you could be made to be of use to them in the future. The land that was thus freed up was redistributed, largely to the poor, this measure securing the CCP a solid base of support which made up for their tentative control over the (somewhat, if not openly, hostile) towns and cities. Generous funds were allocated to a programme of national schooling for all the country's children, and Chinese characters were simplified/standardised to make reading and writing them easier. In 1951 it appeared that North Korea was about to be annexed by South Korea, and then the USA might use the north as a springboard for invading Manchuria. To preserve North Korea as a buffer zone Mao had the PLA dispatch 'Chinese People's Volunteers' to serve in all-Chinese units of the North Korean Army, which was swiftly brought under Chinese control (under Defense Minister Peng Dehuai). When their surprise counter-offensive successfully pushed the UN forces back, Mao then seems to have suffered an attack of optimism and assumed that the Chinese-backed north could annex the south completely. Although he was disabused of this notion when the offensive failed and fighting bogged down into a stalemate over the winter of '51-2, he seems to have chosen to prolong the conflict out of a hope that the US might lose its nerve and sign a more favourable peace if both sides continued to haemmorrhage men and material. After a further year of fruitless back-and-forth attritional trench warfare, in Spring 1953 Mao was finally convinced that A) the war was a stalemate and B) the Americans really were losing patience, but that their response would not simply be to give up and let the North annex the South but rather to use as many tactical nuclear weapons as necessary (i.e. hundreds) to break the deadlock and win. Although China's economy had finally recovered 1937-levels of production and was growing admirably in the first several years after the war (industrial production was growing 19% per year and national income 9% per year, though only 10% of GDP was accounted for by 'modern' industry and services at the time), this wasn't enough for Mao, who decided that China must surpass the Soviet Union in industrial production in 15 years or less. He dubbed the Second Five-Year Plan of 1958-1963 'The Great Leap Forward', declaring that it would be a grand crusade to grow the Chinese economy. The ill-advised setting and hilariously heavy-handed insistence on meeting unrealistic growth and 'growth'-targets from above, lack of impartial reports and the suppression of protests from below, the extinction of a number of animal subspeciesnote Mao wanted people to rely on more traditional Asian medicines, which used animal parts such as rhino horn and big cat bones, causing species such as the Javan and Bali Tigers, the mainland subspecies of Sumatran and Javan rhinos, and recently the Western Black rhinos, to go completely extinct. It's still a major problem to this day. environmental degradationnote Soil erosion and decreasing soil-quality had been issues for three centuries by this point due to heavy land-use in numerous areas, as the 18th-century saw China surpass the previous population-high of the 11th-century Empire of the Song due to the introduction of Corn and Potatoes, staple-foods from The New World and nigh-hilariously idiotic denial by the all levels of party-leadership that anything was wrong resulted in about 35 million citizens dying when they otherwise would not have done of other causes (e.g. influenza, cancer, accidents) - chiefly from starvation-related diseases like Beriberi. The figure of about 35 comes from analysis of the capacity of the land to support life and national census data, since researchers aren't allowed to comb through Party archives. Of course the CCP dubs the period "The Three Years of Natural Disasters" and claims that the famines and resultant epidemics resulted largely or soley from sabotage by and/or the withdrawal of the Soviet advisors in 1959, extraordinary weather events, and long-term environmental damage caused under the feudal and Guomindang governments. Sorting out 'normal' deaths from the 'extra-ordinary' ones caused by the famines was quite a task - with a population of more than five hundred million at the time, a natural death-rate of 1% of the total per-annum would give a figure of more than 15 million people 'ordinary'/natural deaths over that period. Indeed, this is precisely how the high-end '45 million' figure for the famines comes about. The concurrent "Sino-Soviet Split" arose as a result of ideological disputes, foreign policy disagreements, and nuclear proliferation. Mao viewed the Soviet Union as being in imminent danger of losing its whole-of-society revolutionary fervor to bureaucratic ossification, and decried its consideration of socialist market-systems in some sectors of its economy (such as by de-collectivising agriculture) as 'capitalism by the backdoor'. Moreover Mao totally disagreed with Khrushchev's foreign policy of 'Peaceful Coexistence' with the Capitalist Empires while waiting for the inevitable World Revolution - that would be caused by Capitalism's inherent contradictions - to collapse it from within. Instead Mao asserted that the world's Communist Powers should do their utmost to bring about the World Revolution as soon as possible, if necessary by attacking the Capitalist Empires directly from without. And finally, Mao felt that China deserved nuclear weapons when Khrushchev increasingly came to feel - in light of Mao's domestic and foreing policies - that this was unwise and would also complicate arms-control negotiations with the United States. Khrushchev also advised against Mao's collectivisation of agriculture, not least because he himself had overseen a disastrous campaign to do so in the Ukraine. These tensions came to a head in July 1959, as Khrushchev recalled all Soviet advisors from China and refused to deliver nuclear fission weapon blueprints or prototypes in violation of prior agreements. In the following decade, the two fought small-scale, but increasingly intense, skirmishes along and across their mutually-disagreed-upon river borders, particularly along the Ussuri and Heilung rivers. Mao increasingly decried "Soviet Revionism" as the greatest physical and ideological threat to the Chinese Revolution, over and above that of American Imperialism. When the results of the Great Leap Forward became known to the party at large in 1961, the five-year plan was aborted in favour of a disaster-control (i.e. famine-relief) effort spearheaded by Deng Xiaoping, Mao's credibility as a governor was severely undermined and he resigned his position as Chairman. Consequently, official control of the party went to slightly less radical figures like Liu Shaoqi and Deng Xiaoping. Mao described himself as "dead ancestor" — praised but never consulted. In 1966, Mao made a comeback from the shadows of the party — the Cultural Revolution. History was revised and Liu and Deng were blamed for the 'Three Years of Natural Disasters' and subjected to re-education. Mao's newest Grand Crusade to completely destroy China's 'Feudal' and 'Reactionary' heritage of Daoism, Buddhism, Confucianism, and the Abrahamic religions. Mao's chosen pilgrims were the Red Guards, young ideological-extremists (largely students) who destroyed - or tried to destroy - pretty much every legacy of China's history pre-1949. They did a pretty good job, actually, but the Party leadership soon realised that the movement was getting way out of hand - the Red Guard were so convinced of their own (ideological) righteousness that they were actually beginning to criticise the Army and the higher echelons of the Party for being insufficiently communist. In the end, the People's Liberation Army was used to break up the movement - and some Red Guard even fought back. However, the movement was soon crushed and thousands of Party members, including Liu Shaoqi, were Mis-blamed for the failures of the Cultural Revolution and sentenced to re-eudcation or death. Mao slipped back out of the spotlight and into the shadows once more, from which he continued to influence the Party Leadership and its decision and ensure its Mao-ist orthodoxy. Mao was increasingly senile - if not outright mentally ill - by the 1970s, and his wife Jiang Qing and three of her associates later took on a relatively prominent role within the party by 'speaking' for Mao until he died in 1976. Mao's immediate successor, Hua 'Two Whatevers' Guofangnote We will resolutely uphold whatever policy decisions Chairman Mao made, and unswervingly follow whatever instructions Chairman Mao gave" turned on Jiang and her associates, who were accused of causing the entire cultural revolution by themselves - comfortably ignoring the massive popularity of the Red Guard movement - and 'purged' (executed) as 'The Gang of Four'. Deng Xiaoping, who was later re-habilitated, came to the fore for the third time and this time took leadership of the party from Hua on the basis of experimental economic reforms that could well mean the end of communism. This was totally unacceptable to Maoists within the party, but such was the legacy of the Great Leap Forward and The Cultural Revolution that Hua was toppled and Deng was in 1978 able to proclaim the SEZ - Special Economic Zone - experiment. 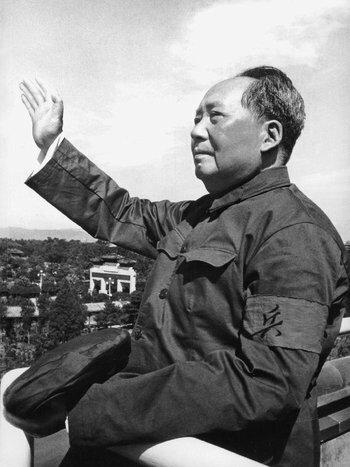 Mao's Cult of Personality was still so strong that, despite the supremely dubious legacy, Deng felt unable to publicly criticise Mao for his failures until 1981. To this day, there are some who still regard Mao - and not Sun Yat-sen/Zhongshan - as the Founding Father of modern China. This may be because the former's pretty-darn-obvious-to-us bungling is not quite so obvious in China, wherein all textbooks are still written by the Department of Education - and wherein the kiddies are told that Mao was fundamentally a good guy who made some mistakes. According to Deng, Mao was "seven parts right and three parts wrong". Like numerous party figures before and since, Deng found it very convenient in political terms to blame the Gang of Four for Mao's actions. Deng Xiaoping managed to undo much of Mao's excesses, and later launched his campaign of To Get Rich Is Glorious, changing China's economy from a socialist based one into a market economy, which allowed for greater private enterprise and ownership. As such, today's China lies closer to Chiang Kai-shek's vision than Mao's own. In spite of this, Maoist memorabilia and "Red Tourism" to Mao's hometown still remain popular today in China due to nostalgia. Mao is also well known as a calligrapher, poet, and military leader, and author of several books dealing with guerrilla warfare and political theories. The most well known is Quotations from Chairman Mao, better known as the Little Red Book, one of the most printed books of all time. Mao is also the Trope Namer for Why Mao Changed His Name. See that page for more details, and simply note that older Western works that reference the Chairman will likely use the WadeGiles romanization of his name, Mao Tse-tung. In the OVA of The Legend of Koizumi, Koizumi's aura is so powerful, it actually causes Mao to rise from the grave so he and Koizumi can engage in a Mahjong battle. Mao teams up with Pol Pot for the match. Mao loses the match, but earns Koizumi's respect as a Worthy Opponent. In one of the early Spider-Man comics by Stan Lee and Steve Ditko, Harry Osborn tells Peter Parker that he's about as popular at Empire State University as Mao. This meant that he was unpopular, as it was before stereotype of colleges as gathering places for the far left emerged in the late 1960s. Kundun by Martin Scorsese features him in a cameo (played by Robert Lin). It portrays him as a bit of an Affably Evil smarmy politician. The movie Nixon features Mao as someone who, during the meeting with Nixon, shows disinterest in politics and diplomacy and more in how Kissinger gets so many girls, to which Kissinger responds with the immortal phrase: "Power is the ultimate aphrodisiac". Forrest Gump (the book) saved him from drowning. Z.G. Li and Joy meet him in Dreams Of Joy, which takes place in China during the 1950s. In a Monty Python's Flying Circus sketch, Mao appears on a quiz show along with Karl Marx, Lenin and Che Guevara. The modern opera Nixon In China naturally features Mao (along with Jiang Qing, Zhou Enlai, and of course Richard and Pat Nixon). Playable in Civilization I to IV. One of the more peaceful leaders, but he's quick to take offense if you ally with anyone he doesn't like. Tends to sink to the bottom of the list near the endgame. Ironically in the Chinese version of Civilization IV, he was replaced by Emperor Tang Taizong. A portrait of him (with eyes obscured) appears in the China stage of Super Dodge Ball. In the canceled game Saints Row : Undercover, the Chinatown district has several neon signs of Mao eating a slice of pizza. The fourth run of Twitch Plays Pokémon, Fire Red, features a Skitty nicknamed "Meow Zedong", who hopes to usher in a communist revolution to the Pokemon world. The Simpsons: The episode "Goo Goo Gai Pan" had the Simpson family go to China, and on the way they visit Mao's mausoleum. When Homer came up to Mao's body, he said to it quietly: "Aww, look at him. He's like a little angel that killed 50 million people. Yes you are! Yes you are!" This episode was Banned in China.note Note that in Real Life you cannot approach Mao's corpse, you have to march past reverently. There are so many people who come to see him that you really can't stop. Rumor is because the embalmer did a very poor job, and they don't want anyone to find out.